We&apos;re well into the new year, and chances are, you&apos;ve lost track of your resolutions. Don&apos;t worry, though, we have some Columbus dining resolutions that will be easy and fun to keep up with. Here are seven Columbus dining resolutions you can keep this year! #1: Try one new restaurant every month! There are enough good eateries in Columbus that you could try a new place every day. Okay, maybe that’s a little overwhelming. Need a helpful starting point? 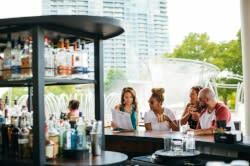 Check out Dine Originals Columbus, a collective of about 40 restaurants, from fine dining establishments to casual cafés, from brewpubs to carry-outs. Buy the Dine Originals Deck, available at the Experience Columbus Visitor Center in the Arena District, for easy ideas. The deck includes 52 cards with promotions and ideas for each restaurant. #2: Explore a new neighborhood! We all get used to our regular haunts. This year, try exploring a new part of town. Head to Powell for dinner at Kraft House No. 5 and drinks at Prohibition Gastro Lounge. Explore all the new eateries opening in Gahanna, like breakfast at SuperChef’s or Cajun/Creole from Da Levee. #3: Track down a food truck! Columbus has a solid food truck scene, from taco trucks lining the west side, to trucks saddled up at local breweries, to neighborhood mainstays. Keep an eye on the trucks’ Facebook pages, use the Street Eats Columbus or Taco Trucks Columbus blogs to get ideas, or follow the trucks on the Ohio Food Truck Finder. Get started by finding Taco Nazo on the northeast side, Ray Ray’s BBQ in Clintonville, or Challah Food Truck at Seventh Son Brewery for brunch. #4: Attend a group dinner, or rent a space to do your own! 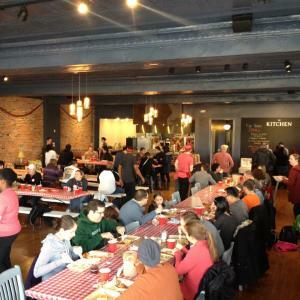 Over the past year, Columbus’s communal and participatory dining options have expanded considerably. The Kitchen in German Village hosts dinners and events in their beautiful wood-floored space. The Commissary in Grandview has begun hosting pop-up dinners and classes, and space is available to rent for your own cooking needs. The Dinner Lab, a national pop-up dining organization, entered the Columbus market, too. They give young chefs a chance to try experimental dishes and get feedback from diners. #5: Go to a food festival! Columbus knows how to do festivals, and we certainly know how to do food festivals. Enjoy live music and ribs at the Jazz & Ribs Fest, try over 40 trucks at the Columbus Food Truck Festival, munch on baklava and moussaka at the annual Greek Festival, or sample a wide range of cuisines at the Asian Festival or Festival Latino. #6: Take a culinary tour! Tours are an excellent way to sample food and drinks with a knowledgeable guide to lead the way. Columbus Food Adventures can take you on walking tours or Short North, Grandview, or German Village, or driving tours of taco trucks, international eats, breakfast, and coffee. Sister company Columbus Brew Adventures ventures to Columbus breweries, distilleries, and taprooms. Got a sweet tooth? You can also schedule factory tours at Anthony Thomas Candy Company. #7: Shop at a local market + use a local food blog to find recipes! Everyone should resolve to support local this year. You can do this by becoming a regular any one of our fantastic farmers&apos; markets around the city, or by visiting local grocery stores like The Hills Market, Huffman’s Market, or Weiland’s. Bonus: get recipe ideas from local food blogs like Harmonious Homestead, A Local Choice, Hummusapien, and The Lean Green Bean.